Multiplayer, online, turn-based combat simulator? Passable. Same thing, but with ponies? Now you've got a game. 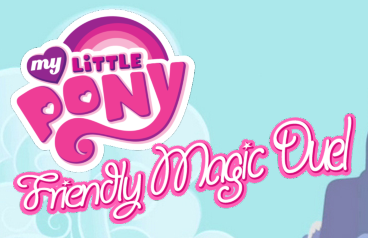 MDV Games' recent release My Little Pony: Friendly Magic Duel boils down to a battle of wits. Timing plays a role (if you can't come to a decision within your thirty-second turn, you've wasted an action) but the majority of in-game strategy revolves around buying various buffs over time to strengthen your team of ponies. Both players assemble a team of three of the mane six (unfortunately, there is only one Fluttershy) before duking it out. As is the case in many tests of cunning and skill, I handily defeated your friendly neighborhood admin Enigma Sage (regardless of what he says.) The game lobby's empty at the moment, but I'm sure we can remedy that!